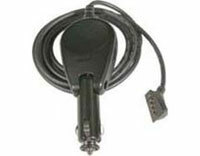 Garmin Vehicle Power Cable with External Speaker (010-10477-07) €48.00 - buy online at mysatnav.ie - Ireland's leading GPS & Sat Nav store. This accessory is a replacement for the 12-24 volt adapter cable with external speaker that came with your StreetPilot 2610, 2720 or 2820. It is also suitable for the BMW Navigator GPS system. It allows you to power your unit off the vehicle's battery and hear voice prompts.